With the warmer weather upon us, snakes are out and about (saw a black snake in my garden just the other day.) In the Upstate, the only three venomous snakes indigenous to the area are the Copperhead, Timber Rattlesnake and Carolina Pigmy Rattlesnake. South of Lake Murray, there are also Cottonmouths and Coral Snakes. Being able to identify the local snakes and distinguish between venomous from harmless is important. With the exception of the Coral Snake, venomous snakes in South Carolina all have slit “cat eye” pupils and heat-sensing recessed pits and nostrils. These snakes are classified as Pit Vipers. The pit is used to sense heat. This heat sense, coupled with a sense of smell (obtained by the tongue - the nostrils are used for breathing and hissing) and sight allows a pit viper to strike its prey with great accuracy. Copperheads have a large head in proportion to its neck. Its distinctive head color is of and old copper penny. The scales have a dark hour-glass pattern and juveniles have a yellow tail. Timber Rattlesnakes are the most dangerous snakes in the Upstate. They generally have distinctive chevron cross bands and have an alternate color phase which is much dark gray to almost black. Juveniles are born with only a single “button” rattle. The Pigmy Rattlesnake is much smaller than the Timber Rattlesnake. The record length is 2 feet 7 inches compared to a 6 foot Timber Rattlesnake. Color pattern varies widely with the brown phase being most prominent, but ranging from red, to pink, to steel-blue, to the nearly black “Dusky” pigmy found only in the southern part of the state. The rattle is so small that it is barely audible when shook. The prognosis for a pet bitten by a poisonous snake varies with the species of snake involved, amount of venom injected, and location of the bite wound. The major clinical problems are local tissue destruction due to the digestive enzymes in the venom, swelling, bleeding, shock and neuromuscular problems. Clinical signs of envenomation may occur within 30-60 minutes or can be delayed up to 24-72 hours following the bite. It is not necessary to capture the snake, but it is helpful if one can determine whether it is a non-venomous or a venomous species. Take a photograph from greater than six feet away and get immediately to emergency care. It is a good idea to restrict the dog’s activity and carry your pet, if possible. If a bite was on the leg, one should elevate the affected limb to keep it at heart level. Do not apply a tourniquet or ice and do not administer any medication. Bites are quite painful, so do be careful when transporting to the hospital. Antivenin can be used to help neutralize the venom and should be administered within 2 to 4 hours of the bite. 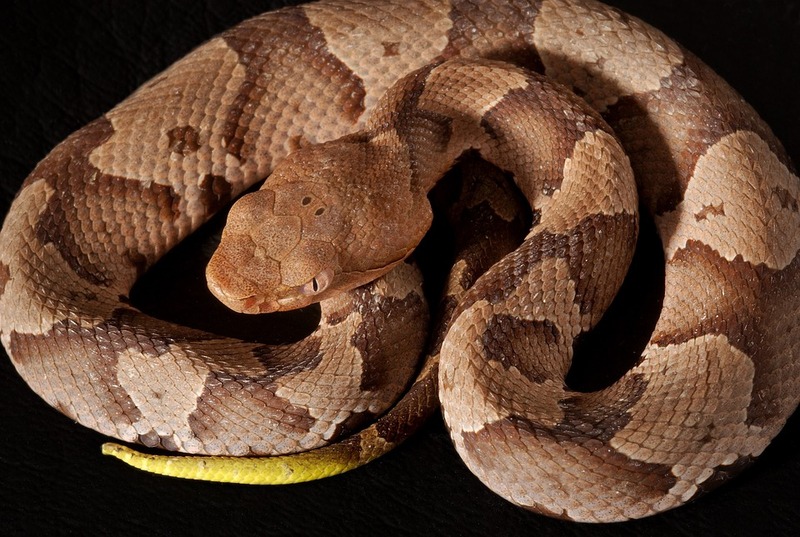 Traditionally, antivenin is usually not necessary for a Copperhead bite, but hospitalization and observation is a must. Preventing snake bites is your best defense. While out walking, controlling your dog with a leash and stay on open paths where there is an opportunity for snakes to be visible. Do not allow your dog to explore holes in the ground or dig under logs or flat rocks. If your dog seems unusually curious about something hidden in the grass, back off immediately until you know what it is. It is advised to keep nighttime walks to a minimum, Rattlesnakes are mostly nocturnal. Be careful out there, but have a fun time enjoying our beautiful Upstate.